NORTH BAY, Ont. 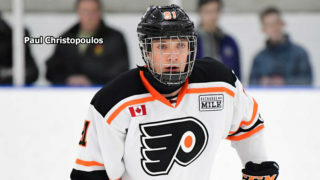 — Ryan Roth scored one goal and assisted on another as the Sault Ste. Marie Greyhounds defeated the North Bay Battalion 5-1 in Ontario Hockey League action Thursday night. Mac Hollowell, Jaden Peca, Roman Pucek and Zack Trott also scored for Sault Ste. Marie, which got 32 saves from goaltender Matthew Villalta. The win was the fourth in a row for the Greyhounds, who have a won-lost-extended record of 28-10-5 for 61 points atop the West Division. Justin Brazeau scored for North Bay, which lost a third consecutive game and is 21-21-3 for 45 points, third in the Central Division. Goaltender Christian Propp faced 39 shots before 2,192 at Memorial Gardens. Seconds after Keeghan Howdeshell drilled the puck off the post, defenceman Hollowell opened the scoring at 4:31 of the first period, beating Propp with a long shot to the stick side. Peca scored what proved to be the winner at 11:56, cruising across the goalmouth and waiting for Propp to commit before firing the puck past the goaltender’s outstretched glove. Pucek struck 48 seconds later as he took a pass in the deep slot from Morgan Frost and put home a backhand deke. The Troops, who were outshot 15-9 in the period, produced three good chances. Villalta reacted quickly in the fourth minute as Luke Burghardt tried to convert a Brazeau pass while stationed at the lip of the crease. Villalta, who gloved a drive by Burghardt as he rushed to the net in the seventh minute, parried a Daniel Walker effort in the 15th. Brazeau connected on the power play at 11:31 of the second period as his screened shot from the top of the right-wing circle eluded Villalta. Matthew Struthers and Burghardt assisted on Brazeau’s team-leading 42nd goal of the season. Brazeau, who leads the OHL scoring race with 76 points, one more than Tye Felhaber of the Ottawa 67’s, has 109 career goals, fifth on the franchise list and two behind Raffi Torres. North Bay had a 14-13 edge in shots in the frame, testing Villalta on a number of occasions. The goaltender foiled Luke Moncada on a two-man rush with Burghardt in the fourth minute and denied close-range chances for Brazeau and Struthers in the seventh. Penalty killer Moncada couldn’t lift the puck over a prone Villalta in the 15th minute, and Brazeau narrowly missed converting a backdoor play at the right post a minute later. Propp was sharp, foiling Trott at the right post early in the frame and challenging Barrett Hayton’s shot at the lip of the crease in the 14th minute. Propp took a Jacob LeGuerrier drive off the mask in the 17th minute and made two late stops on Peca in close. Roth restored the visitors’ three-goal lead at 6:47 of the third period, ripping a feed from Robert Calisti inside the left post, and Trott poked home a loose puck on the power play at 19:54. 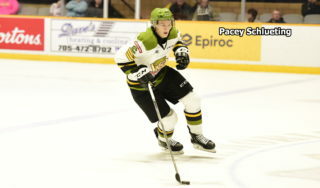 The Battalion plays host to the London Knights at 2 p.m. Sunday in the second of five consecutive games at home. 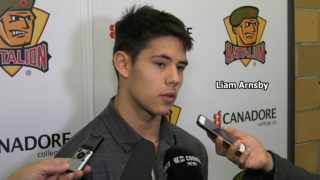 BATTALION BULLETS: It was the third of four games between the teams, who split two at Sault Ste. Marie, the Greyhounds winning 6-0 on Sept. 22 and the Battalion prevailing 3-2 in overtime Oct. 14. They complete the season series Feb. 14 at North Bay … Kitchener native Nick King played his 100th game on the Battalion blue line. 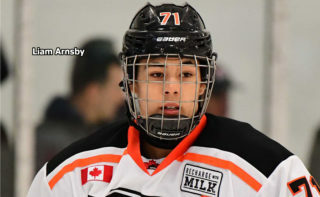 He has 11 goals and 35 assists for 46 points since an Oct. 23, 2017, trade from the Owen Sound Attack, for which he played 40 games, earning three assists … Battalion defenceman Theo Calvas was taken by Sault Ste. 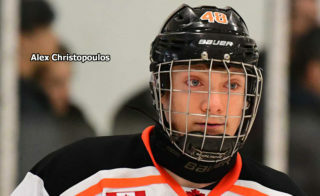 Marie in the 14th round of the 2015 OHL Priority Selection, playing 54 games with the Greyhounds before a trade to the Sarnia Sting, from whom the Troops acquired the resident of Bloomfield Hills, Mich., last Oct. 9 … The Battalion went 1-for-4 on the power play. Sault Ste. Marie was 1-for-2 … The Battalion, which dressed 17 skaters, one below the limit, was without Travis Mailhot, Simon Rose, Kurtis Evans and Cameron Peters … Mailhot, who has played only three games this season because of injury, marked his 19th birthday … Hayton saw the end of a 16-game points streak in which he scored 13 goals and earned 15 assists for 28 points. 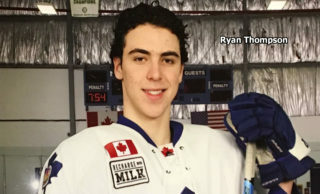 It was the fourth-longest such run in the OHL this season … Frost has a four-game points streak in which he has three goals and five assists for eight points … The referees were Ryan Harrison and Tom Sweeney.